Heat oven to 350°F. Place cookie dough rounds 2 inches apart on ungreased cookie sheet. Bake 14 to 18 minutes or until edges are golden brown. Cool 3 minutes; remove from cookie sheet. Cool completely, about 15 minutes. Place 1/2 cup ice cream on top of each cookie; place 4 to 5 inches apart on same cookie sheet. Cover loosely; freeze until hardened, at least 1 hour 30 minutes or until serving time. Meanwhile, in small bowl, mix strawberries and jam; refrigerate. To serve, heat oven to 450°F. In small bowl, beat egg whites with electric mixer on high speed until foamy. Gradually beat in sugar until stiff peaks form. Beat in vanilla. Spread egg white mixture over ice cream on each cookie, covering ice cream and cookie edge completely. Bake 4 to 6 minutes or just until meringue is lightly browned. Immediately remove from cookie sheet; place on individual dessert plates. 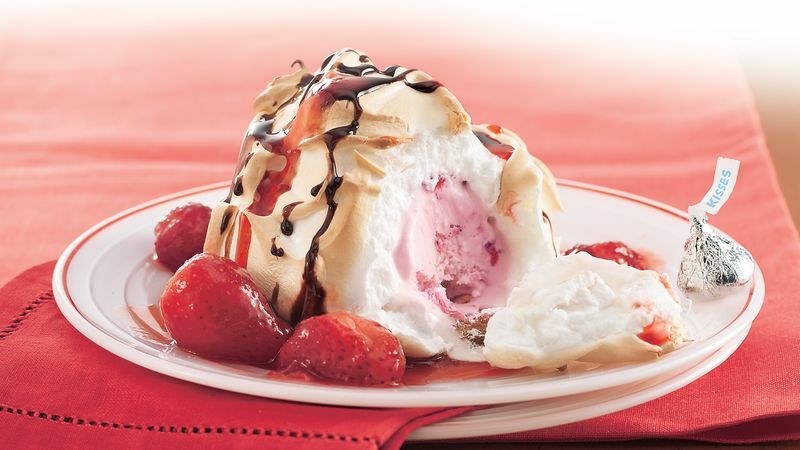 Place strawberries from sauce on side of each dessert; spoon sauce over tops. Drizzle chocolate topping over each; place wrapped milk chocolate candy on each plate. Serve immediately.